Apache-tomcat is a web server which processes static requests and provides a number of services .The container in fact provides services for web applications.Here comes the distinction between web servers and the application servers where application servers are capable of processing dynamic requests. and set the environment variables PATH to fullyqualifiedpathofjavafoldername/bin and JAVA_HOME env to fullyqualifiedpathofjavafoldername.Tomcat server looksup for the java from the JAVA_HOME env. Download Stable version of Apache-Tomcat version from the url : http://tomcat.apache.org/download-60.cgi .Download tar.gz file and uncompress it in a proper directory. Set the environment variable CATALINA_HOME to fullyqualifiedpathoftomcatserver.Append the PATH variable with fullyqualifiednameoftomcatserver/bin. 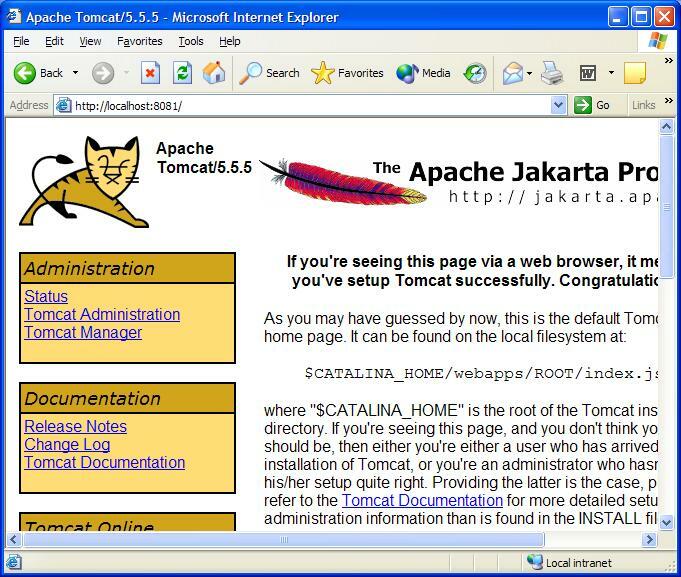 To run the tomcat server goto tomcatpath/bin and run the startup.sh file/startup.bat file.If your tomcat has been installed properly following page will appear. This entry was posted on Sunday, October 3rd, 2010 at 10:59 am	and is filed under Java. You can follow any responses to this entry through the RSS 2.0 feed. You can leave a response, or trackback from your own site.